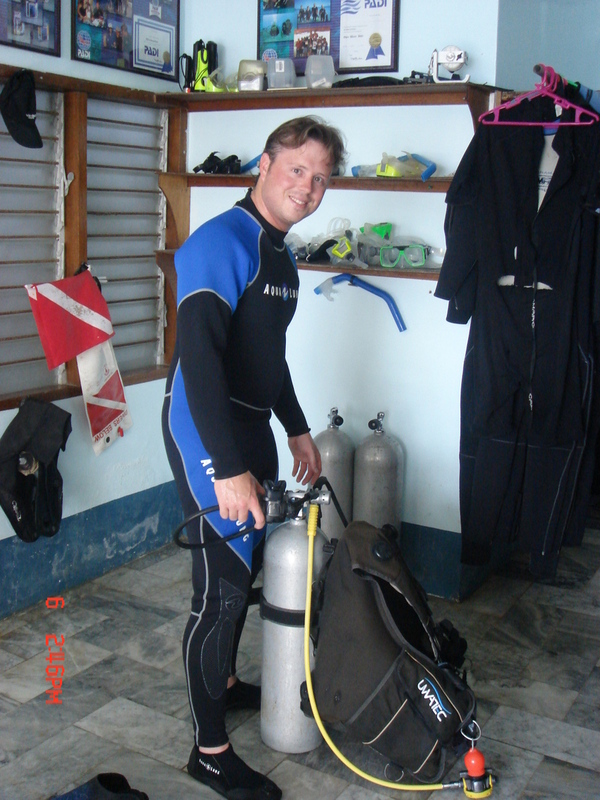 This is me getting ready to dive. Jiao Jiao really likes this picture. The last night before leaving, we went out to the bars until closing time. We had a great time, it was Saturday night and there was a live band at a semi-non-girly-bar that most of the non-hunters went for their kicks, but hunting was available here too. We stayed out until closing time. This is one of the two bands that were playing that night. This is also a picture of the worse of the two bands that was playing. This band played too much slow, romantic music which in certain situations is fine, but ion this night it even put Jiao Jiao to sleep. The bands played alternating sets, so there was not much house music time and everything flowed very quickly. The other band was much more entertaining. 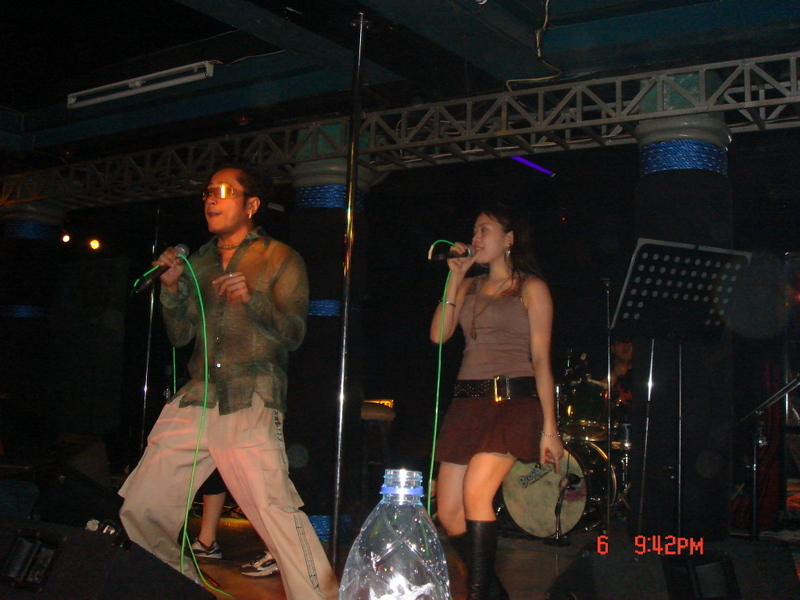 They had two lead singers, a man and a woman, and the woman was a charismatic personality that could work any crowd. They also had a guitar player that could really play, their last set started out with a 15 minute "face-melting" solo. We do not have pictures of that band because we were dancing when they played. 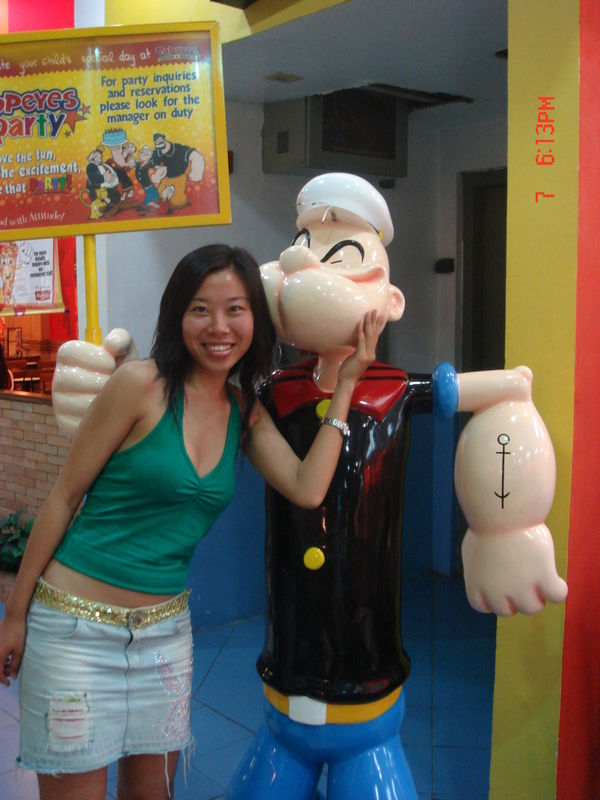 This is Jiao Jiao with a girl we made friends with, she was also in the bar that night. After our good night, it was time to leave and, not wanting to break tradition, I threw money out the window for the kids to dive for. 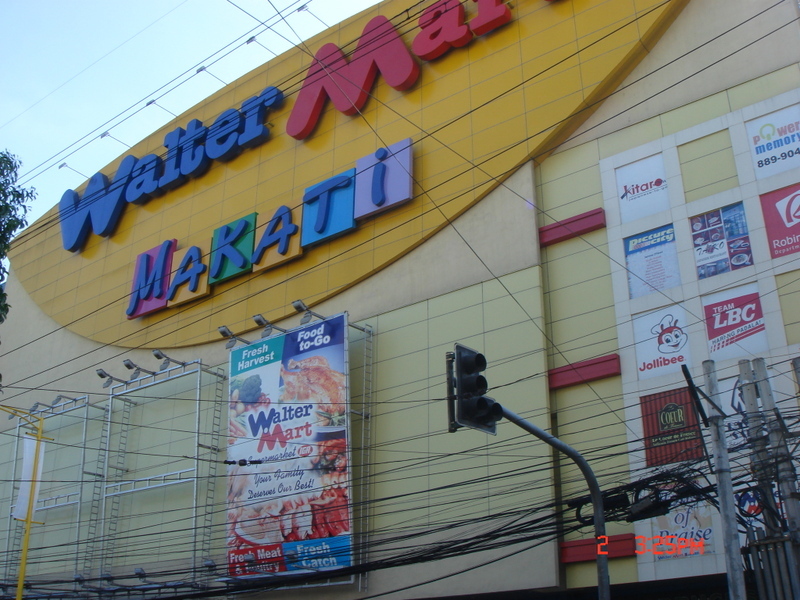 After getting back to Manila, we went shopping in the mall where we had a really good time. 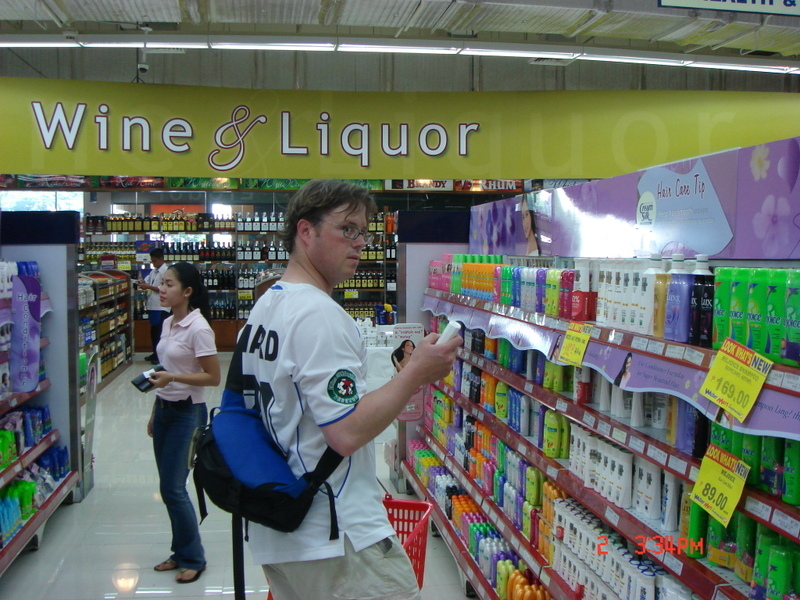 Jiao Jiao really enjoyed seeing all of the different items that are not available in China. 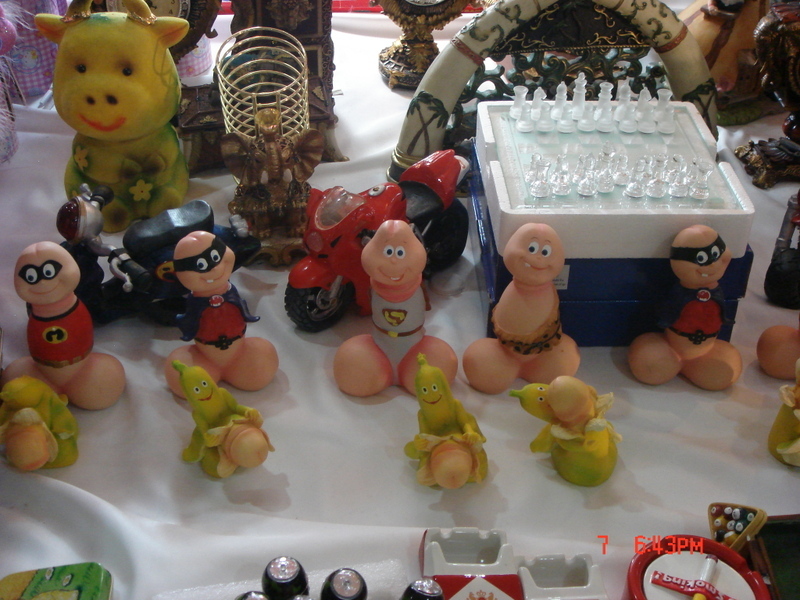 Then these characters wanted to get their picture taken. 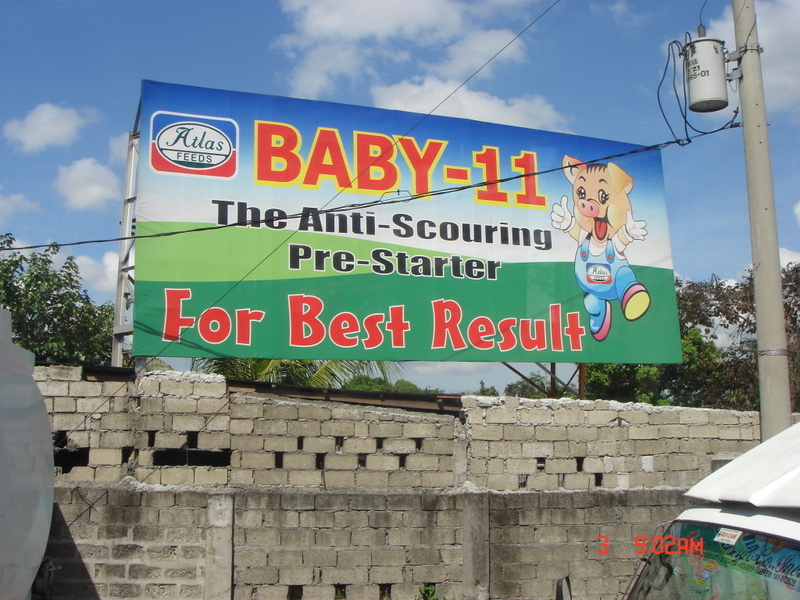 People in the Philippines, unlike China, often want you to take their picture. Finally, we have these things. Jiao Jiao did not know what they were at first. Once she figured it out she laughed hysterically, commenting about how Chinese stores do not have this thing. Then, she noticed a massive sticker on the back saying, "Made in China." Eventually, she bought one. 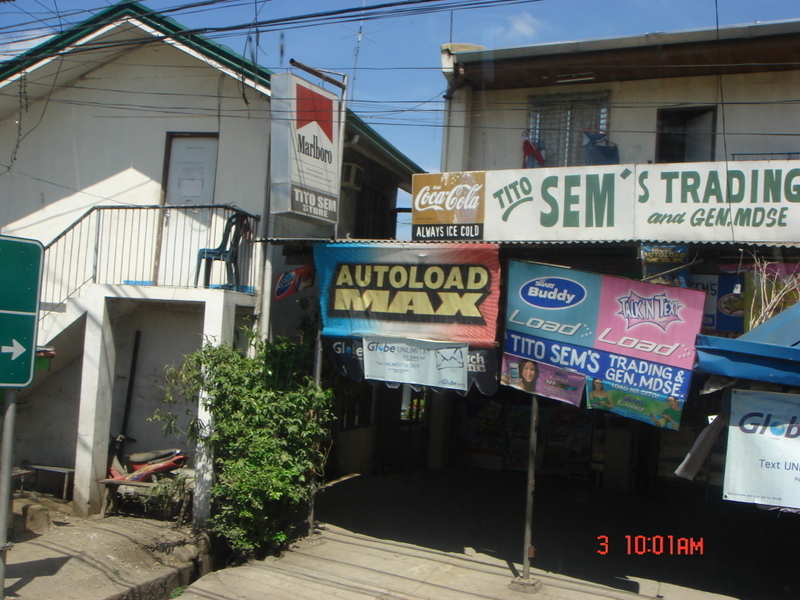 At about 9 in the morning on the Wednesday, we took a jeepney around the little island. 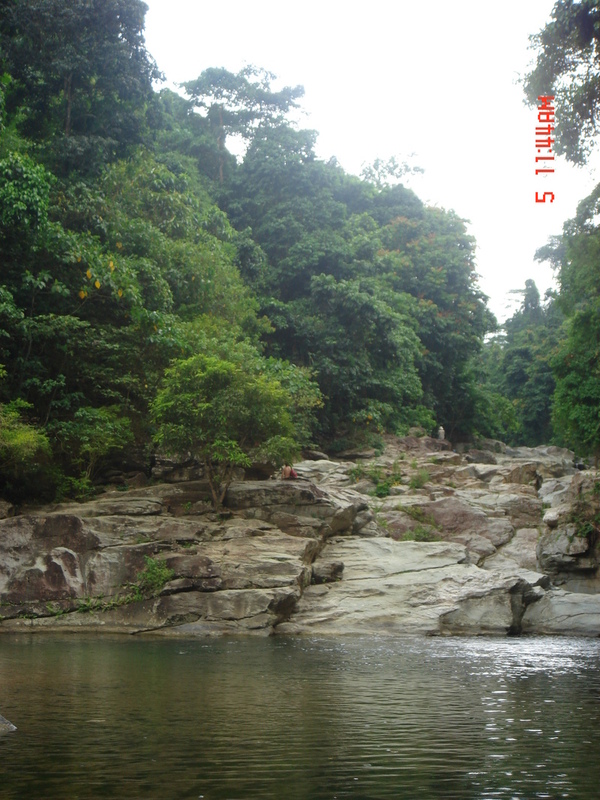 We stopped at some view points, 5 minutes each, on a long drive to our jungle entry point. 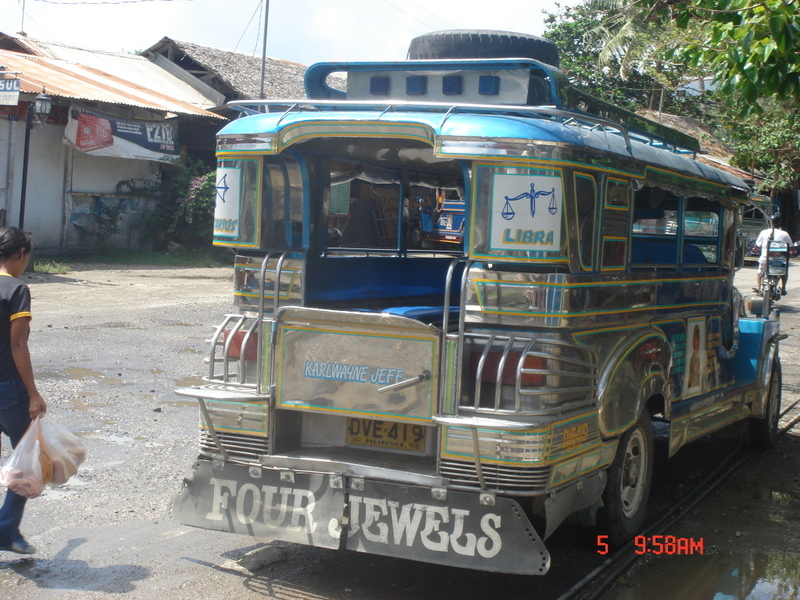 Here is a quick picture of one of the jeepneys we saw on the way. This owner's name is on the back of the truck, like all of the stores. Isn't that the name of some serial killer from America? I swear it is. Look-out point number 1. Beautiful, you can look for 5 minutes. No more. Stop-point number 2. 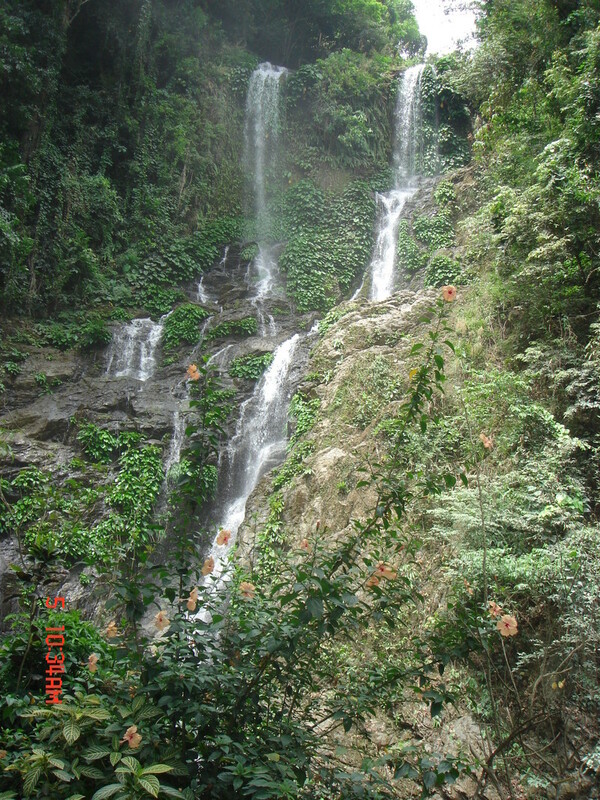 The waterfall, you can look for five minutes. No more. After this, we headed to the drop off point where we were to walk back into the jungle for our oasis swimming and barbecue. 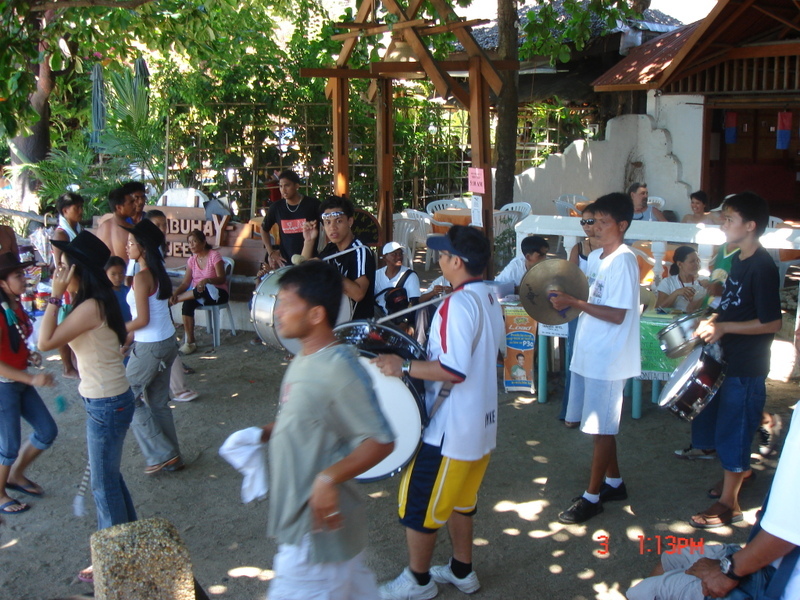 Along the way, many of the local children were accompanying us and making conversation with us. 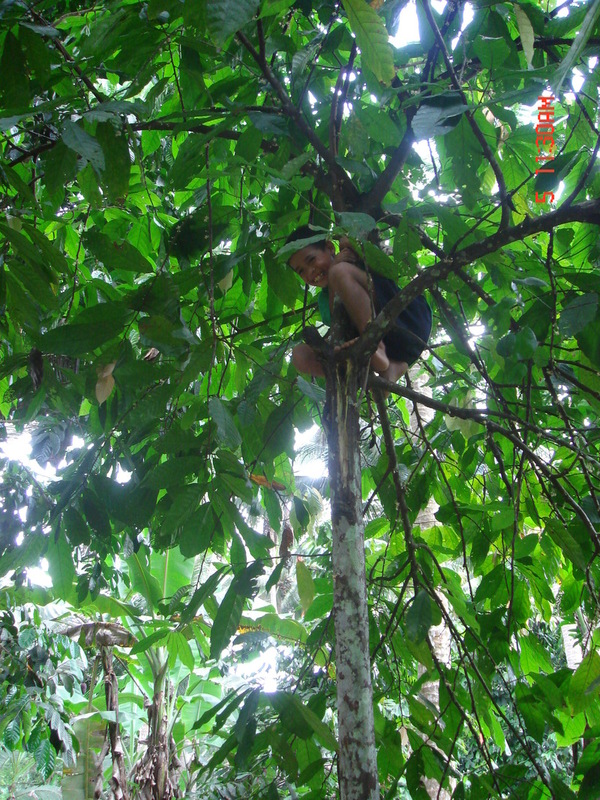 They also showed us many interesting things, this boy is getting a cocoa out of the tree. Apparently they are worth good money. Finally, we reached our oasis. We swam, refreshed and relaxed. 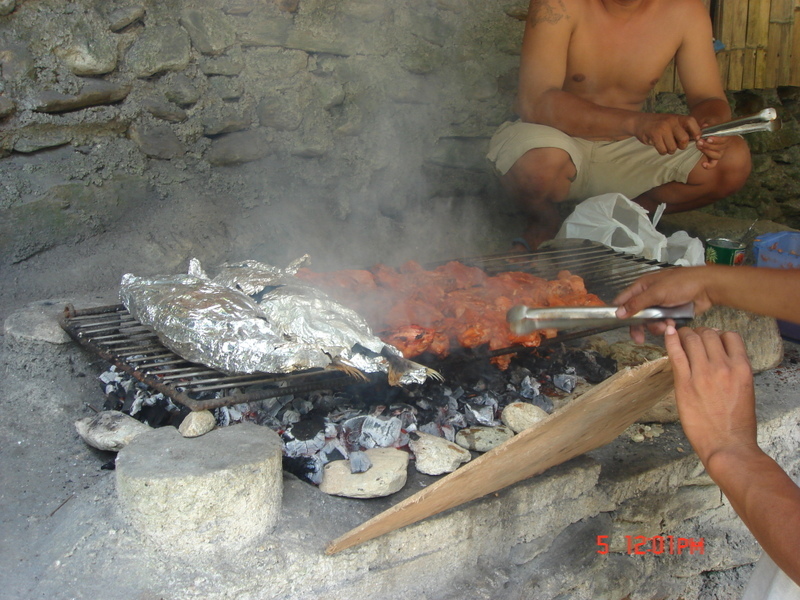 The barbecue was going, and the feast was spectacular. The meat, fruit, coleslaw and ice- cold drinks really treated us well. We finished with an ox ride out and a 2 hour kayaking trip that was less than climatic. It was hard work though. All in all, they day was super, it was the best organized tour I had ever taken. For the finally of this post, you can see one of the odd plants that was littering the trail to the oasis. We woke up and ate breakfast. 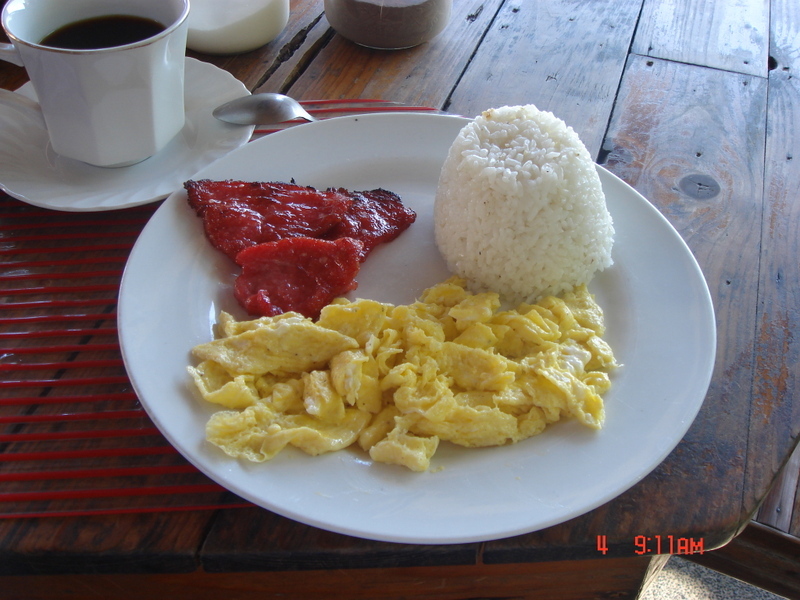 This is the Filipino breakfast at Ed's. Battered milk fish, egg and rice. The fish was super nice. 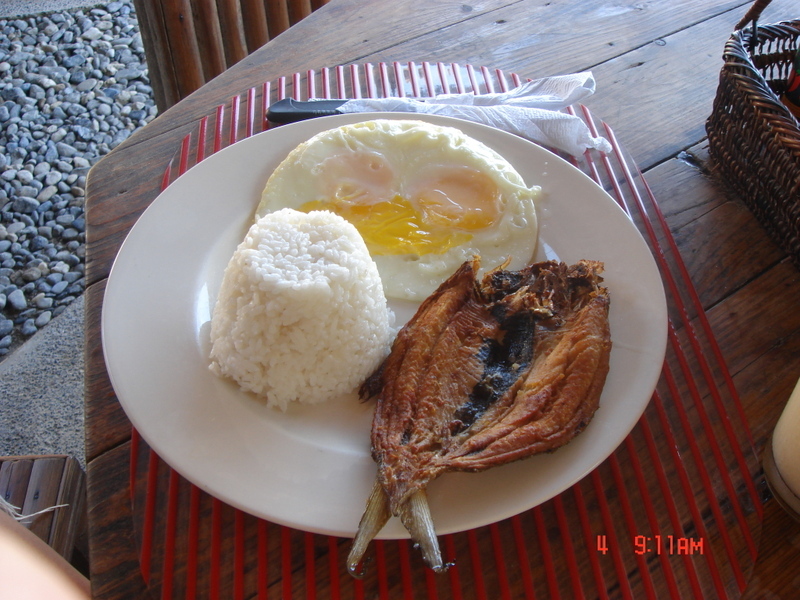 This is the Pinoy breakfast at Ed's. Candied pork, egg and garlic rice. It was also good. The way that Jiao Jiao and I were eating was ordering two dishes and then grabbing whatever we wanted from the others plate so we could both enjoy a number of different dishes. We have started to do that in other places as well, like Saturday night at Outback Steak House. The problem here is that I like steak medium and she likes it well done. 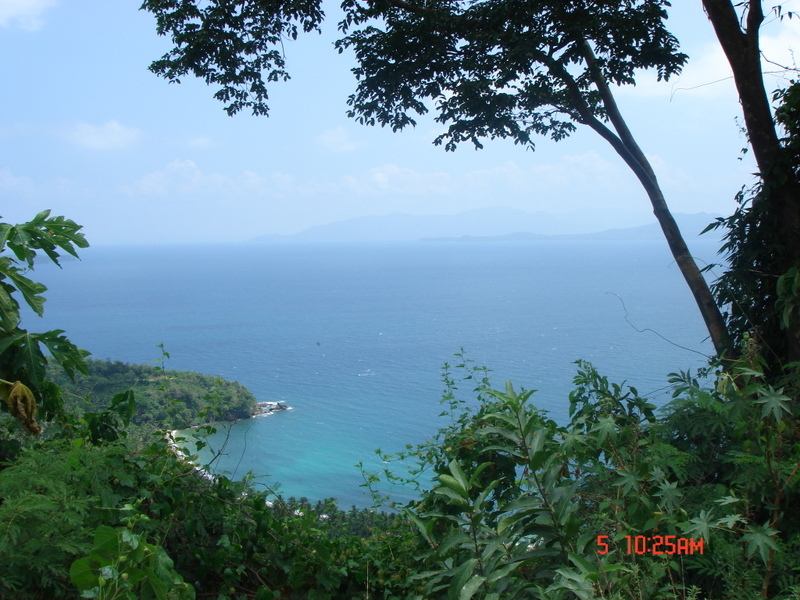 After breakfast, we took a walk from Sabang to a place called Lalaguna. 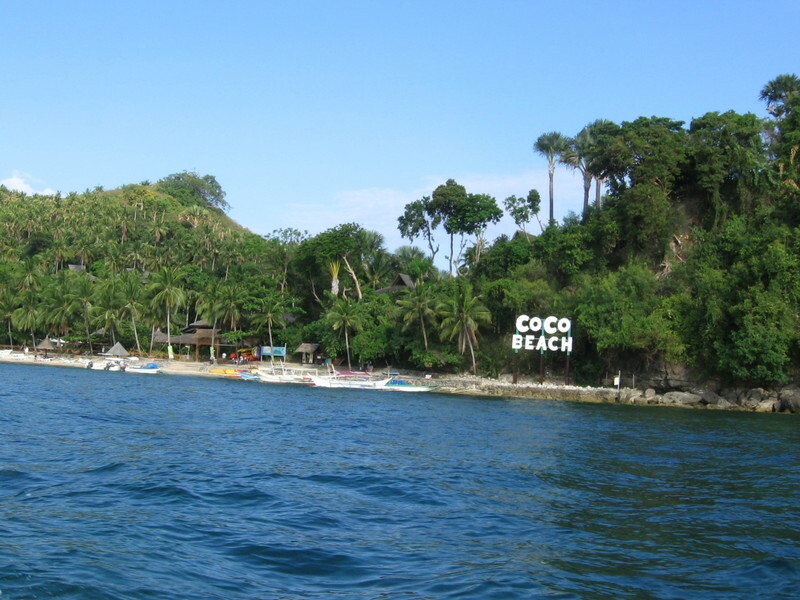 It is just over a little hill, but the beach is nicer, but staying there puts you far from the nightlife. Hot and sweaty, we returned to the Sabang area and booked a tour for the next day. With no real plan for the remainder of this day, we rented a boat and boat driver to take us to the "Coral Garden" for snorkeling and then "White Beach" after. 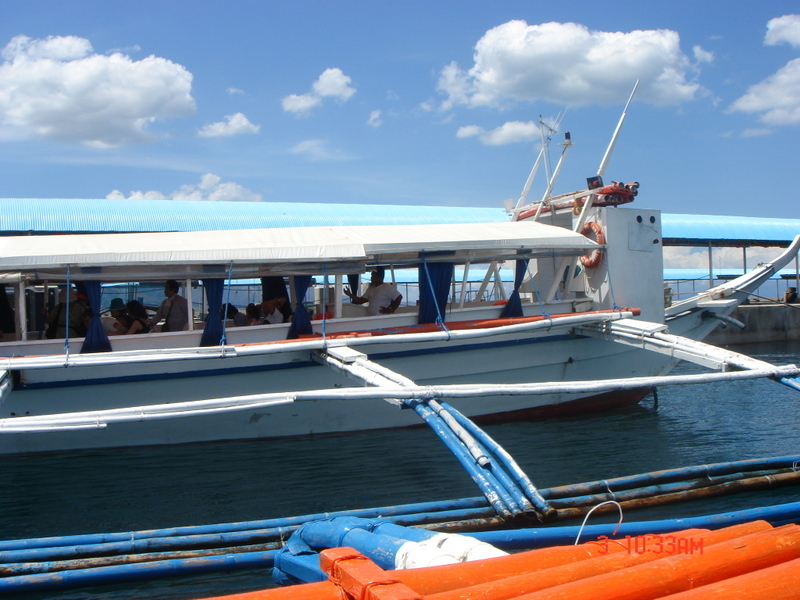 Similar to the "black taxi" of China, we took a "black boat" in the Philippines. While we were snorkeling, he parked on the beach to wait. The boat police came and gave him a fine at that time, probably based on the fare he would get for our trip. If you perv over Asian girls, maybe this will stop you. Jiao Jiao is ready to get in the water. 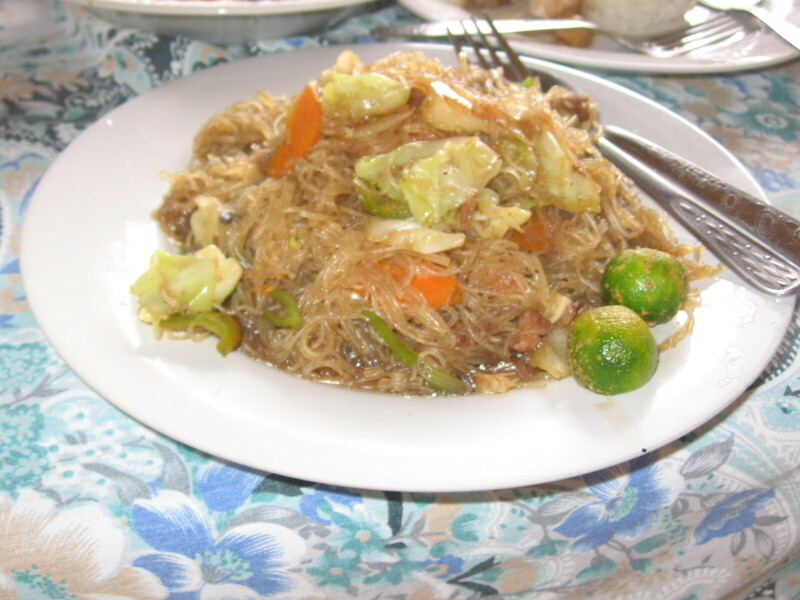 To finish up the pictures, I will show the pancit we had for lunch, followed by some pictures of the roundabout boat tour on the way back and then finish it up with the result of our trip. We are on white beach, don't I look European. 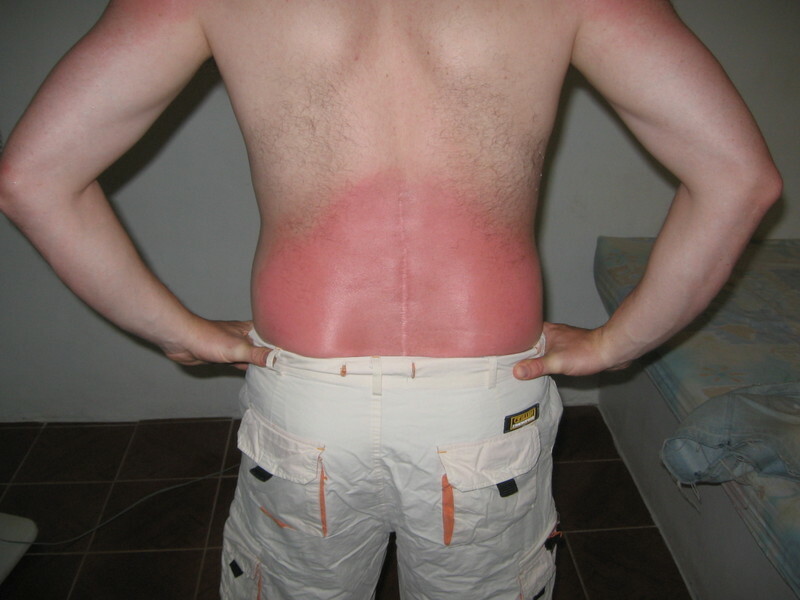 It hurt for more than a week!!!! It is still peeling. 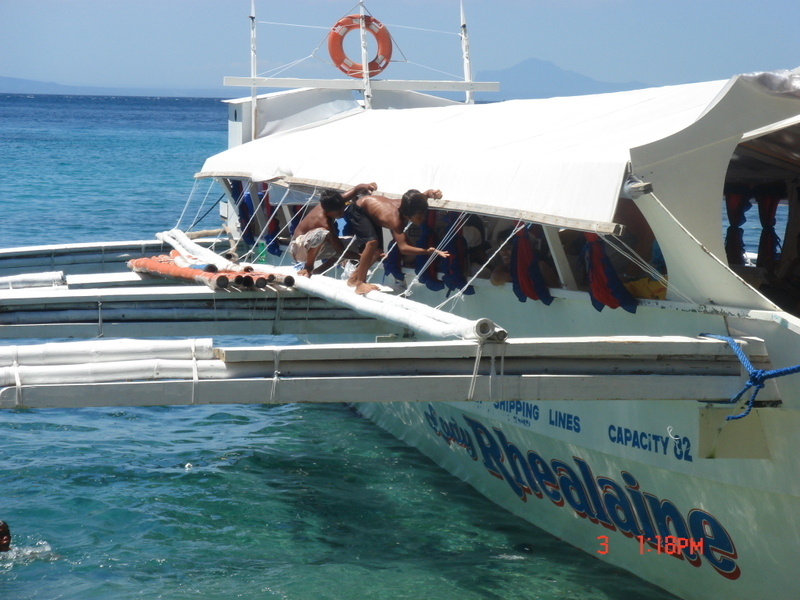 We got onto our little boat for the trip to the island resort at about 11:00. 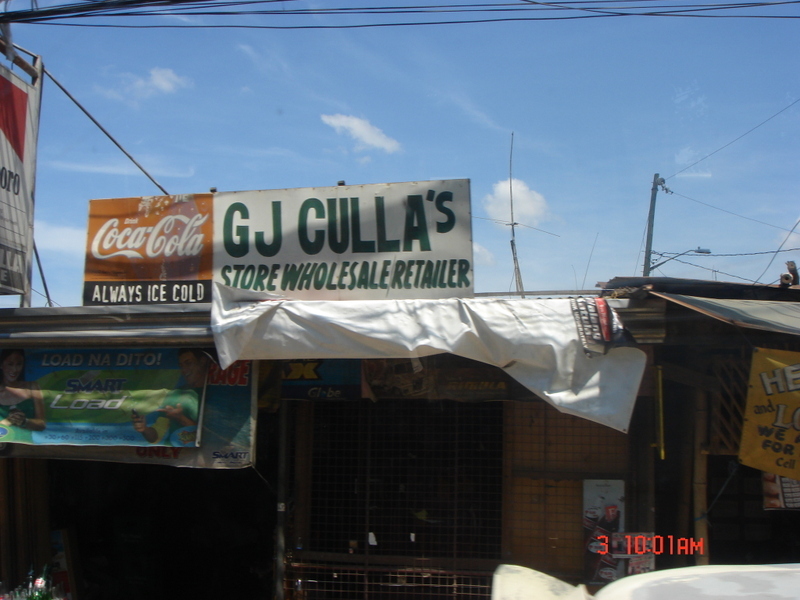 It would be about an hour and a half ride, so I got some icy cold San Miguel Beer and we sat down and relaxed. The boat did not have too many people riding, it was only Wednesday. We scooted across the water toward our destination, enjoying the frothy delight along the way. The boats traveling to this island have increased in size since the last year. I noticed the change immediately. The previous year, we put our bags in the middle in a long row and it left no room for our feet. This year there was a whole row of garden furniture running down the middle for people to sit on. We got to the island and the owner of Eddie's Place snatched me up and told me to follow her to a place to stay. I followed her because she was headed to where I wanted to go anyway, and she had done the same thing they year before. I believe she remembered me. After a few days, she started calling me and Jiao Jiao both by name. We followed her up the stairs to the "Red Coast" hotel and as I walked up I heard, "Hey, you live in China, right?" I was shocked by this, so I could only reply, "Yeah!" We decided to go to dinner at The Big Apple that night and then Jiao Jiao and I went to lunch back down at Eddie's place. 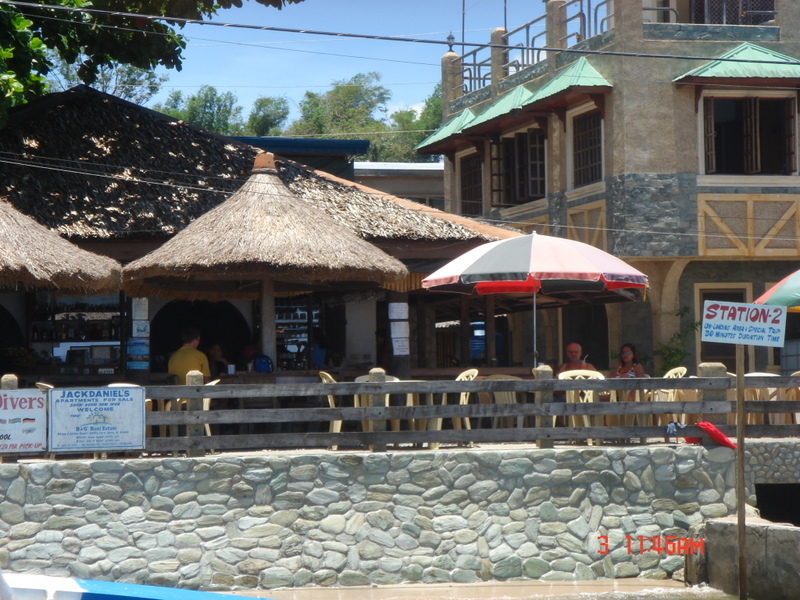 We could sit under the straw umbrella's shade and watch the boats go in and out while enjoying some nice Philippine food. 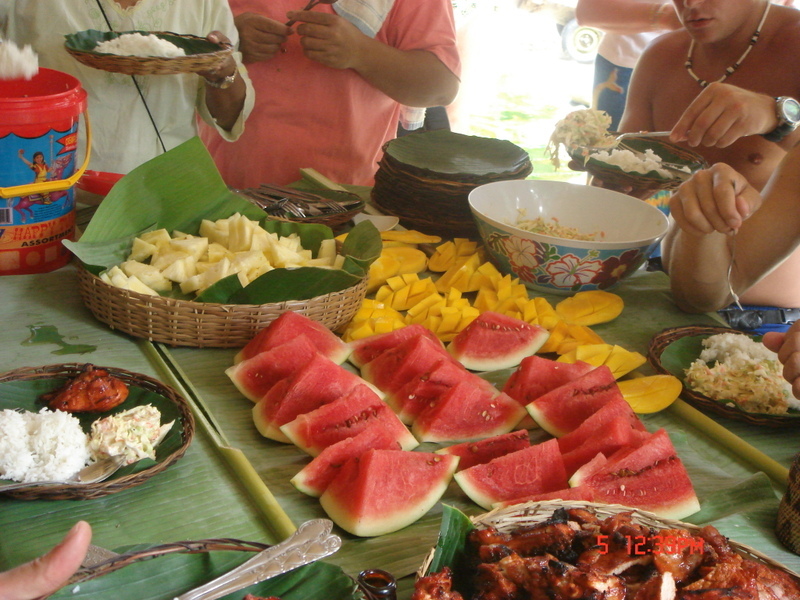 For about 200 pesos, or 32 kuai, or 4 dollars you can get a nice dish. We had a chicken dish and a pork dish. The previous year, I had been living on a steady diet of Chinese food in China, so in the Philippines I had mainly consumed western delights like burgers and pizza (they do this stuff up NICE). Since returning from that first trip to the Philippines, I have eaten more western food in China, I cannot remember the last time I went to a Chinese restaurant for a meal, so this time Jiao Jiao and I often ate local dishes. 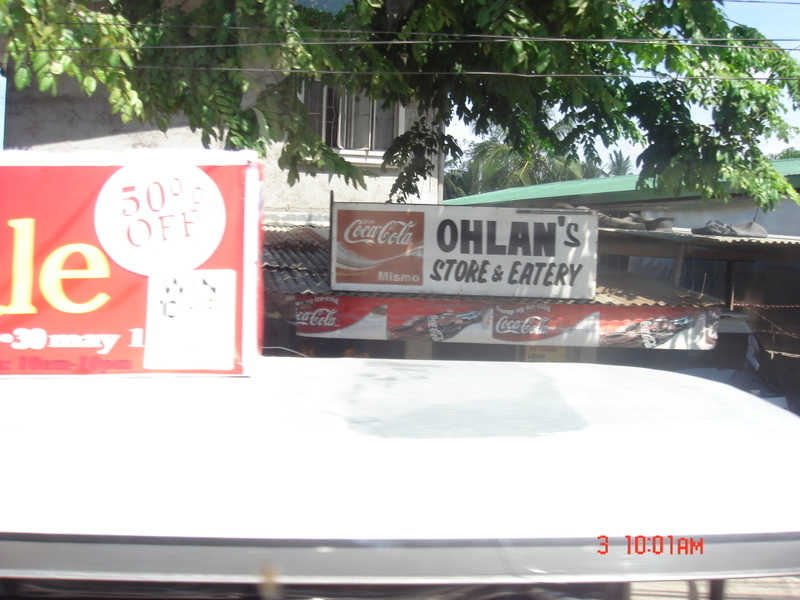 She commented that, "Philippiens people also do not like to put oil on their food." To this I replied, "As far as I know, only the Chinese like to do that." 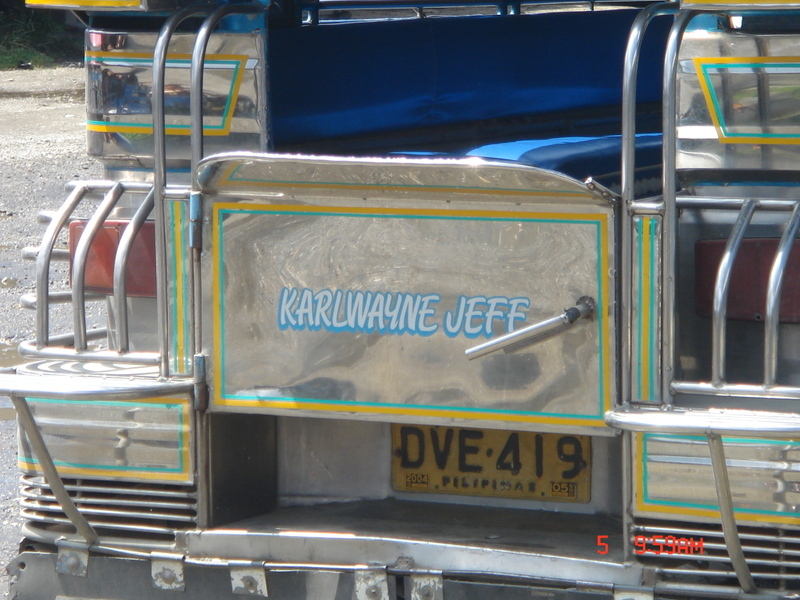 She had also commented that, "Philippines drivers really listen to the rules." Later this bacame funny because a guy we met, Colin, teaches English in Korea said, "Korean drivers and bad, but I think that Philippines is a little worse." Wonder what he would say upon arrival in China? Our boat to the island. The boat welcoming crew and touts. 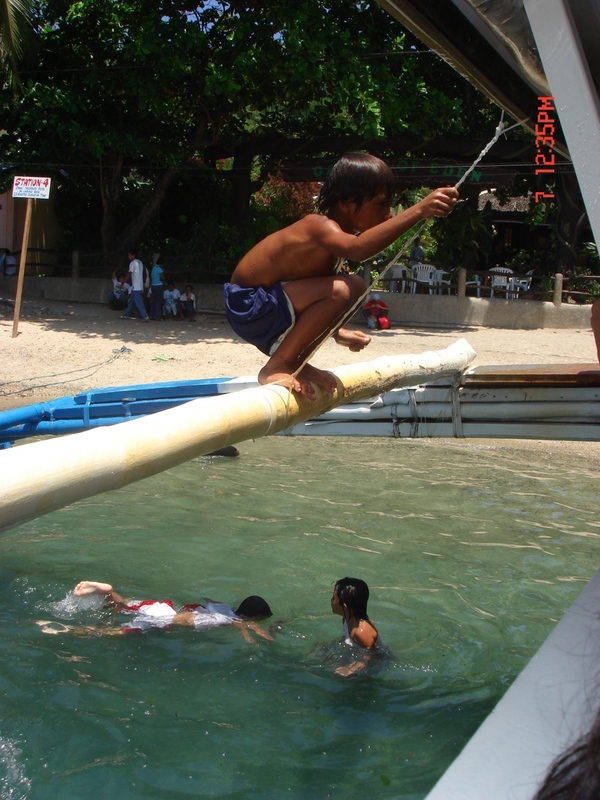 Finally, the kids that ask the people leaving to throw coins into the water so they can dive and get them. Of course, it is a scam to get money, but they are really good at it. Jiao Jiao noticed that they always give the money to one boy. The Godfather of diving beggars. We decided to move out of Manila as soon as possible, there is not really too much to see and do in the city. 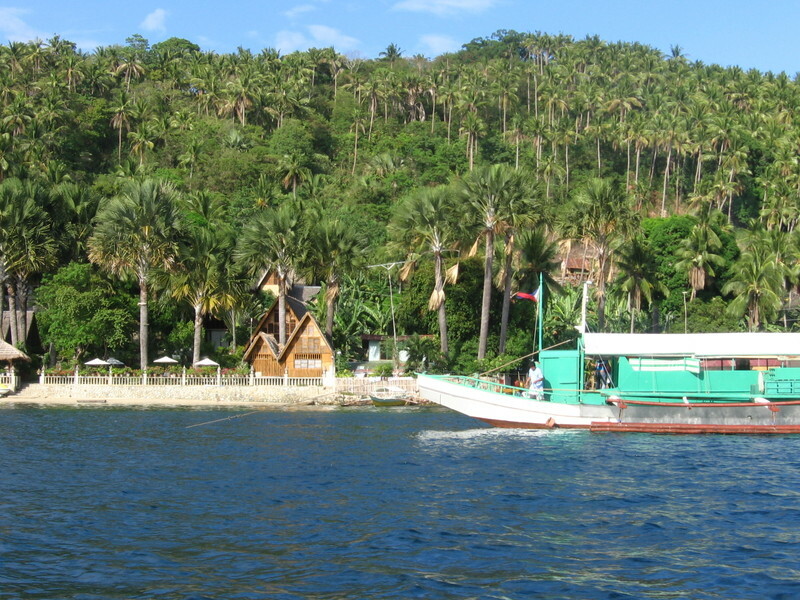 The two choices available were 1) taking a plane to Boracay or 2) Taking a bus and boat to Sabang, the beach resort where I had stayed before. 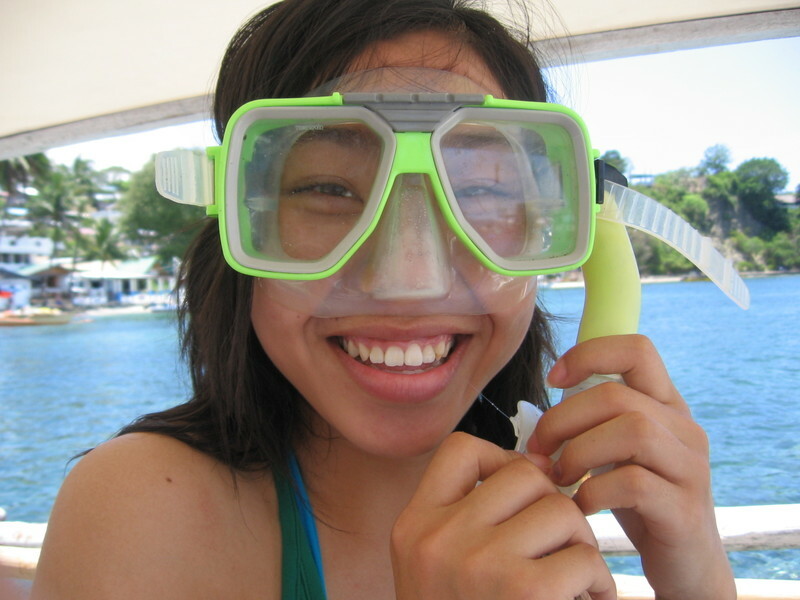 I heard that Boracay has one of the most beautiful beaches in the world, but it is very touristy. 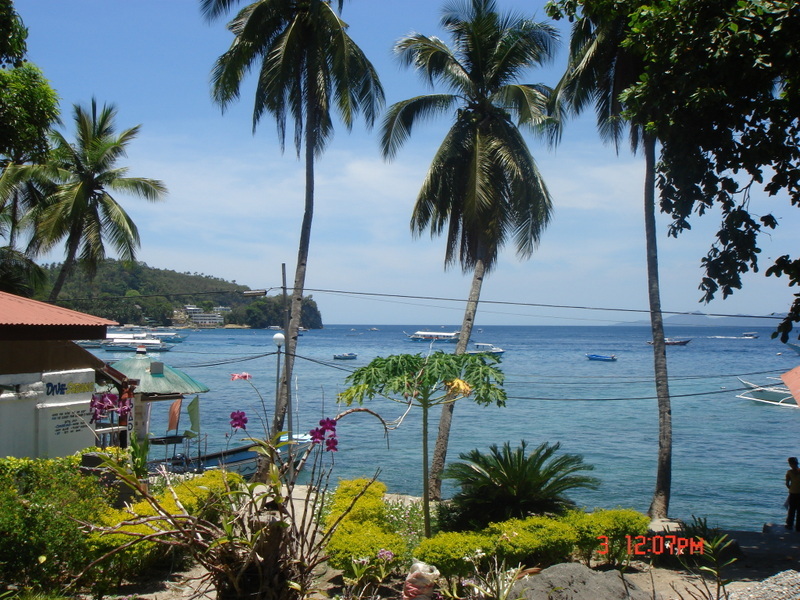 Sabang, is less tourist oriented, smaller and it is cheaper to travel there. But, what most shaped the decision was the fact that the Boracay plane flew out at 8, but the airport was about 2 hours away, making this a start at 5 am trip. That sealed the deal for me, back to Sabang it was. 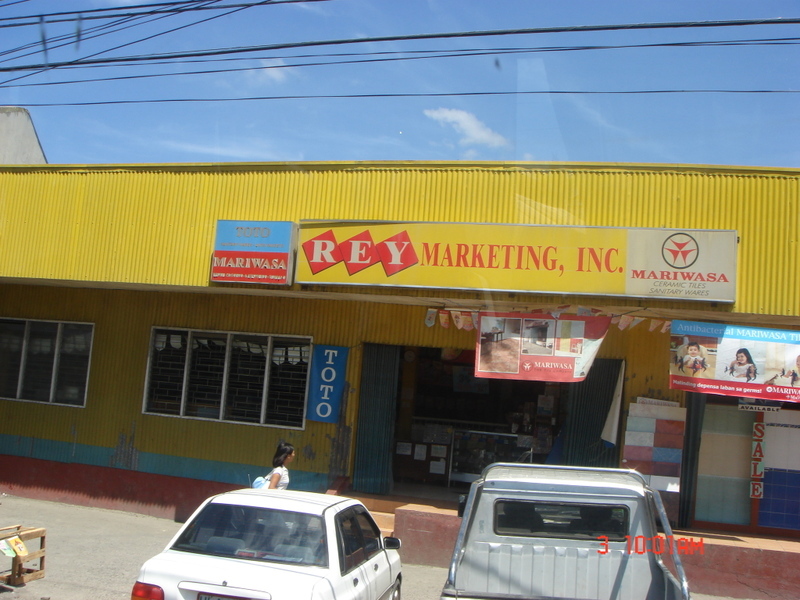 On the bus trip, I noticed a funny thing about all of the shops sitting shoulder to shoulder along the road, they were all named after their owner. Never the name, Super Snack Shop. 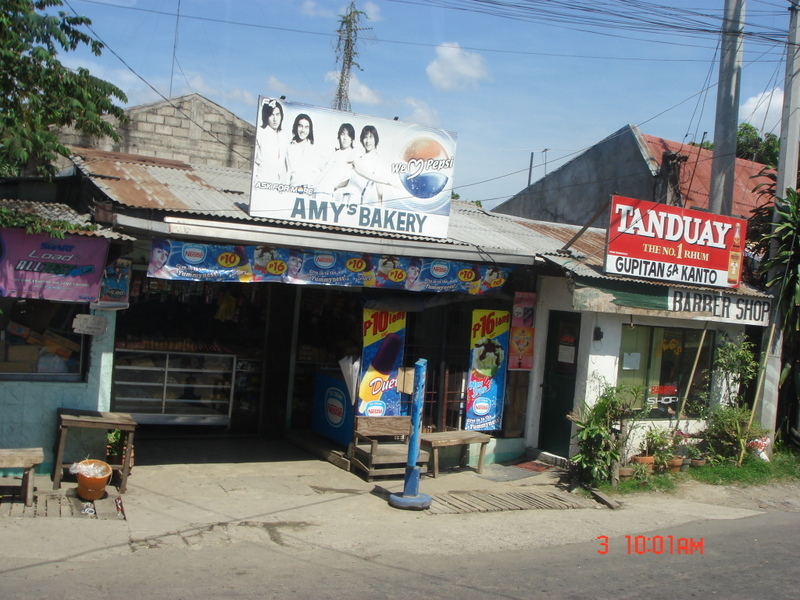 These communities do not seem that small, but maybe everyone can know who exactly Amy of Amy's Shop actually is and moreover, they choose Amy over Sanchez. Odd indeed. Those stores were the view most of the way, but there were a few other funny signs to show that were not someones name. I do not understand the language of this sign. A pre-starter would never be able to begin, am I wrong? But, I do like the idea of food being anti-scouring...it sounds like the scouring food would be rough on the way out. My misunderstandings of language continue into other signs as well. 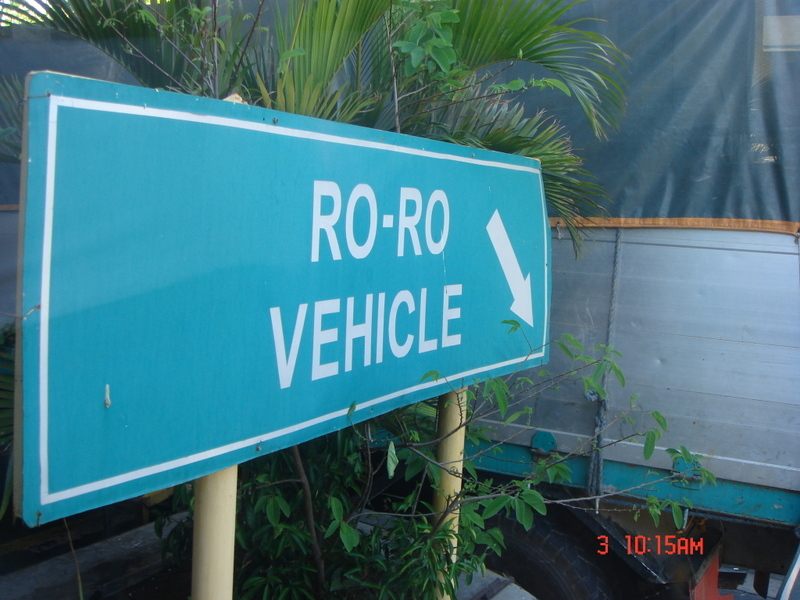 Correct me if I am wrong, but I am gonna wager 200 that a ro-ro vehicle is a boat. Maybe that is the lane that all trucks pulling a boat should take through the toll booth, we are at the port. After our Makati wanderings, we went back to the Malate area and decided to have dinner on the pier because all along the seashore there are small restaurants with bands. 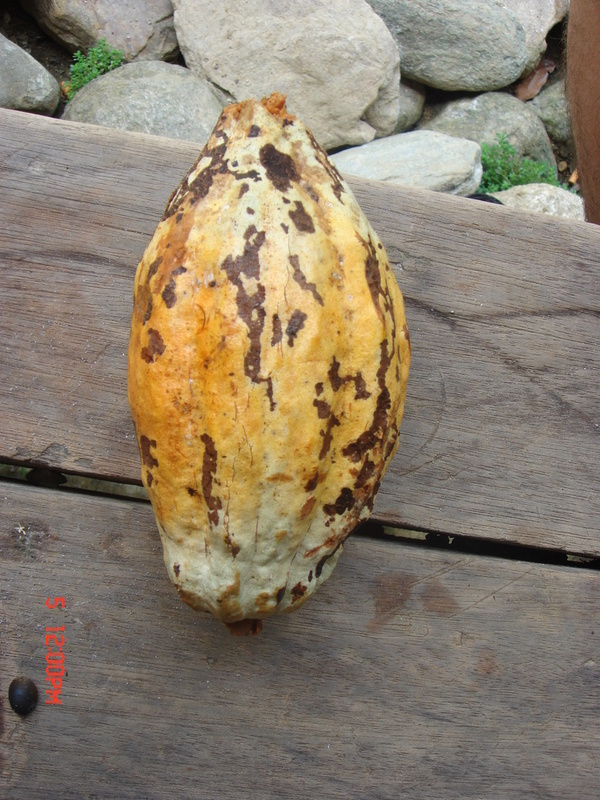 We found one that looked to be ok and sat down. Now, when we sat down and ordered we did not realize who the band would be. Shortly after ordering, we found out- The Fat Babes! The dinner was good, the entertainment was, in my opinion, lacking something. We finished up and went back into the seedy nightlife area. We went into a bar called Amazonia, where the barmaids were all dancing on top of the coolers wearing nothing except bikini bottoms and chest paint. No pictures, sorry boys. But, I have some more pictures of the things we had seen in the day time. This is of course Jiao Jiao at the pier during the daytime. This is a man bathing his baby in the ocean water. Suprisingly, the water and the area surrounding it were relatively clean. When we were walking through Makati we were smoldering hot and so sweaty, luckily we came across this air-conditioned heaven. Can you guess what it was like inside? Oh Hell Yeah!!! But the best is saved for last. That is right, Rodman is still around and playing basketball. 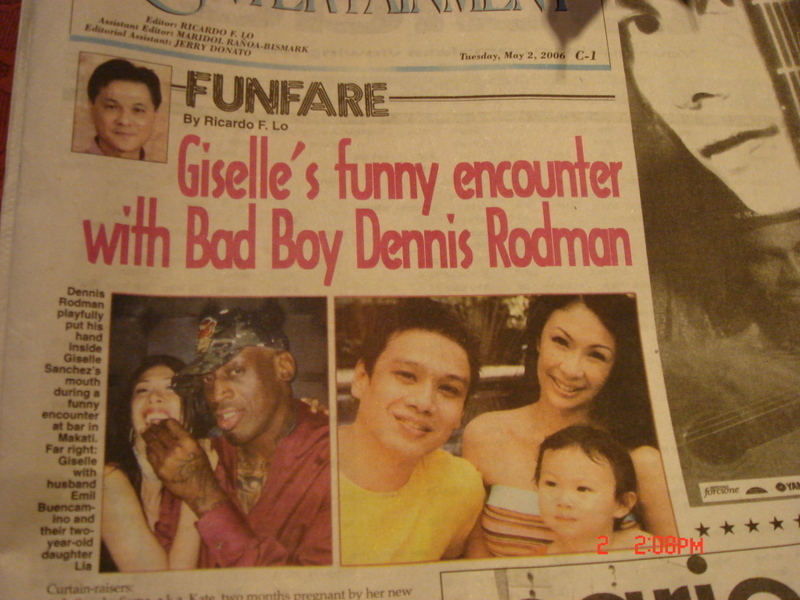 He is playing for the "Bad Boy Tour" and they are currently in the Philippines. What the whole thin is of course is basketball promotion with a few players still young enough to walk or in debt enough to join.